Deciding on a sleeping system is a major consideration when packing for an expedition or alpine climb, as a good night's sleep can make the difference between feeling groggy and slow or energized and on-point. With so many mats on the market it can be hard to choose: Classic closed-cell foam mats are virtually indestructible, but inflatable ones are often lighter, more compressible and more comfortable. On more than one occasion, I've endured a cold night's sleep on a punctured and deflated pad, so I hoped Sea to Summit's inflatable UltraLight mat would last. Over several weeks this summer, I carried it on backcountry climbing excursions to the Bugaboos, Wind River Range and Rocky Mountain National Park to see how it would hold up to hard use in rugged conditions. After weeks of testing the pad, it neither popped nor showed signs of wear, despite crawling over it in a cramped tent full of sharp climbing hardware and sleeping directly over gravel. Though called UltraLight, this mat weighs 5 to 15 percent more than comparable sleeping mats because it's constructed with 40-denier ripstop nylon to achieve greater puncture resistance. 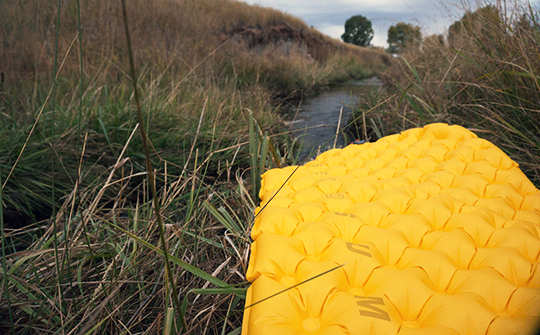 Therm-a-Rest and Exped's lightest mats use 30-and 20-Denier ripstop nylon, respectively. The first thing I noticed while lying on my side was that my hip didn't fully compress the mat to the ground. This is because the egg-carton grid of interconnected cells is better at supporting bodyweight than the tube-style design common in Big Agnes and Exped mats. Also, since the mat doesn't use the crinkly heat-reflective coatings common on Therm-a-Rest mats, it remains silent when I shuffled around on it. The UltraLight mat weighs 12.5 ounces and rolls into a 3-inch by 6.5-inch stuff sack—about the same size as a rolled up lightweight fleece. That's 28 percent smaller and only slightly heavier than the 12-ounce Therm-a-Rest NeoAir XLite. Over the years, I've exhausted myself blowing into Therm-a-Rest and Big Agnes mats, especially when at altitude, and appreciated not having to repeat that process with the UltraLight mat, which inflates with a modified stuff sack. There are two methods to inflate it: The Jet Stream Pump Sack and the waterproof Air Stream Dry Sack Pump. While both options work well, I found the waterproof Air Stream more useful as it kept my down jacket dry when stuffed inside it. While the UltraLight kept me warm during a chilly September bivy above tree line in Rocky Mountain National Park, it doesn't have enough insulation to be used on snow. With an R-value (which stands for resistance to conductive heat flow) of only 0.7, this mat is optimized for summer use. In comparison, traditional closed-cell foam mats such as the RidgeRest SOLite has a R-value of 2.8. The insulated UltraLight (which I did not test) comes with Thermolite insulation giving it an R-value of 3.3 and it has a nozzle designed to keep from freezing. Though warm, its rating is less than Therm-a-Rest's NeoAirXTherm, which has an R-value of 5.7. Pros: Comfortable, quiet, compact, durable; modified stuff sack doubles as air pump.